The School of Planning, Architecture and Civil Engineering (SPACE) at Queen’s University Belfast (QUB) will be running its third annual Street Society live project for one week in March. We’re now actively looking for potential clients and projects located throughout Northern Ireland, ideally in rural locations. If you’re interested, or know someone or a group who might be, please ask them to contact my colleague Paul Bower (details below) by next Tuesday. Street Society is a one-week design research office. It brings together first year students from both the undergraduate BSc Architecture and the Masters in Architecture course in the School of Planning, Architecture and Civil Engineering at Queens University Belfast, to work on a range of projects for clients. It will run between Monday 12th Friday 16th March 2012. The Street Society is now looking for potential clients – external organizations, architects, built environment professionals, community organizations, etc. Potential clients will have a question that architectural students can help to answer; a design problem; a site to evaluate; a building, material, or construction process to investigate, document, or better understand. This year the emphasis is shifting from the urban to the rural, and we are looking in particular for clients and projects that are in someway set, related to, respond to, or operate in the countryside of Northern Ireland. If you are interested in submitting a project proposal for one of the offices of The Street Society please forward a 300 word description to pbower02 <–AT–> qub <-DOT-> ac <-DOT-> uk no later than 12.00 midday, Tuesday 21st February 2012. I have the somewhat ambitious (but highly strategic) target of fleshing out, structuring and mostly writing one draft chapter of my thesis per month through the summer. If I can complete this task by October, I’ll be able to enter the long dark nights of winter with six months in hand to beat the thing into shape before I submit in it March 2012. Hence, this month, my primary writing pre-occupation has been a chapter on the general context of higher education (HE) over the last three decades and the more specific context of architectural education (AE) over last two decade and a half. It’s given me the opportunity to get into some of the numbers that are in the public domain relating to both HE and AE. The graphs I’m presenting below are all generated from the data I’ve scraped from the relevant websites, statistics and annual reports. Some of the data will find its way into the chapter, some not. But taken together, it’s been a helpful opportunity for me to crunch some numbers and test some hunches. It has been a task to download countless .csv and .xls files from government websites, and then a painful chore to manually scrape other data from annual reports that are helpfully published only in pdf format (I’m looking at you, RIBA and ARB). The data is all Copyright of its respective owners / publishers, and the graphs presented here are my own. All this is work in progress; I may one day be able to publish this data with a more rigorous analysis and carefully verified sources, so for the time bring trust this only as far as you can throw it. Data recording the number of students in higher education in the United Kingdom is available from two sources: the Office for National Statistics (ONS), which provides archived ‘Social Trends’ data for at ten year intervals between the 1970/1 and 2000/1 academic years, and the Higher Education Statistics Agency (HESA), which provides data annually between the 1995/6 and 2009/10 academic years. 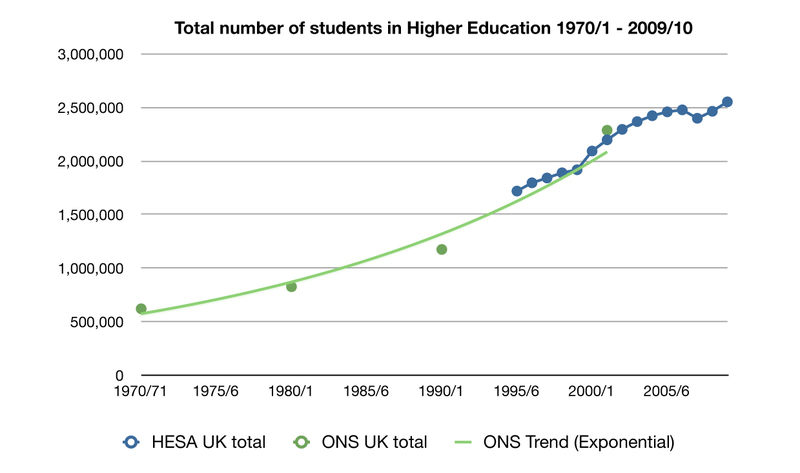 Combining the two sources on one graph (and plotting an exponential trend line from the ONS data) indicates the clear continuation of the trend in growth of student numbers between the academic years 1995/6 to 2000/1, when there were 2,553,250 part and full time students in HE. The growth in student numbers during the last two decades is significant, but is broadly in line with the growth experienced since 1970. As you might notice (clicking on all of these graphs will load a larger version) for the one academic year of overlap between the two sources of data (2000/1) there is a slight discrepancy between the two sources (89,395 students, or of 3.9%). I can’t determine the cause of this, and while its within a reasonable proximity not to be worrying I’d be interested to hear any suggestions why the ONS and HESA disagree. The data gets more interesting when you break it down by the four constituent countries of the UK. 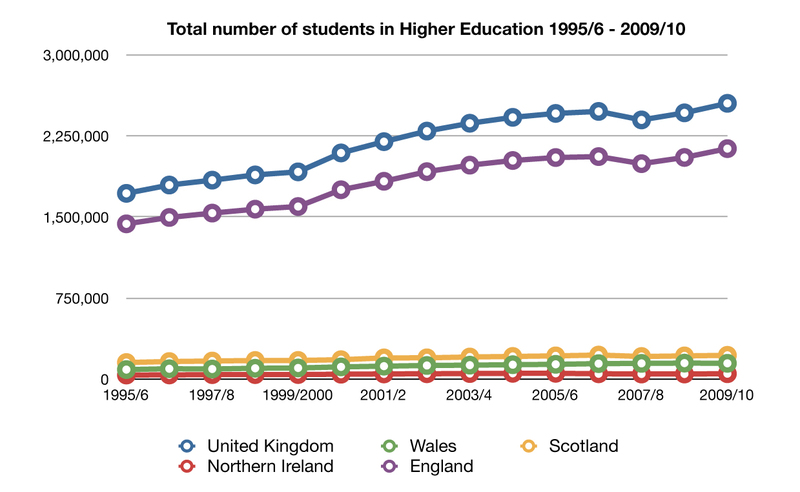 As you can see from the next graph, almost all of the growth in UK student numbers has happened in England. Scotland, Wales and Northern Ireland have maintained modest growth. I still need to collate the opening dates of new universities in the UK, so I expect some of the growth in student numbers in England to have been caused by new universities opening during this time frame. Over the four academic years between 1996/7 and 1999/2000, student numbers increased at average of 2.8% per year. This relatively stable period of growth was disrupted in the 2000/1 academic year, with an increase of student numbers by 9.1%. Over the four academic years between 2000/1 and 2003/4, student numbers increased at an average of 5.4% per year. This rate of growth relented slightly 2003/4 and 2007/8, but for the two most recent years available the data would suggest a return to growth above the rate established between 1996/7 and 1999/2000. So, despite a few blips here and there, the number of students in higher education in the UK is growing exponentially, and it has been growing for some time. The widening participation agenda of the New Labour era has had a lasting impact on HE, with more people going to university or other forms of HE now than ever before. So what about architecture? Since the 2001/2 academic year, the Royal Institute of British Architects (RIBA) has published an annual report compiling statistics provided by RIBA validated schools of architecture and statistics relating to office-based candidates for RIBA Parts I, II and III (they’re online here). Complete or partial participation in the survey supporting the RIBA Education Statistics is voluntary, and as a result some reports do not represent the statistics of all validated schools, and I’m presuming that not all schools completed (or were able to complete) all parts of the survey. The implications of this voluntary participation are discussed below. Whereas the ONS data can supplement the HESA data on general HE statistics, without published statistics pre-dating the 1997/8 academic year, conclusions regarding the number of students studying architecture should be limited to the twelve years available (data for the years 1997/8 was provided retrospectively in the first 2001/2 RIBA Education Statistics report). The next chart illustrates the total number of students in all academic years of RIBA validated architecture courses with the number of new entrants to RIBA validated Part I and Part II courses. Things are pretty stable from 1997/8 until 2002/3. The sharp rise in the total number of students studying architecture in the 2004/5 academic year is notable, representing a year on year increase of 19.67%. Presented at a slightly larger scale, here are the new entrants to Part I and II courses. While the RIBA Education Statistics Report 2004/5 was correct in reporting an unprecedented near-20% increase in total student numbers that year, it is clear that this jump in student numbers was heightened by an anomalous drop in 2003/4, visible in both preceding graphs. Although the RIBA Education Statistics Report 2003/4 does not explain that year’s drop in student numbers, it should be noted that fewer schools chose to participate in the that survey than in any previous or subsequent year. Problematically, after 2002/3, RIBA Education Statistics Reports do not expressly state the number of schools participating in the survey, only the number of validated schools that chose not to participate in either the entire survey or that did respond to certain questions. For example, the 2003/4 Report notes that “all but three Schools of Architecture provided information for this report.” I’m still trying to work out the total number of validated courses at each year for the duration of these surveys, but will hopefully find that and other data next week when I have a few hours spare in the RIBA Library. Given the difficulty in ascertaining the comparability of the 2003/4 survey against other years, it would be apposite to consider that year’s results as an exception. 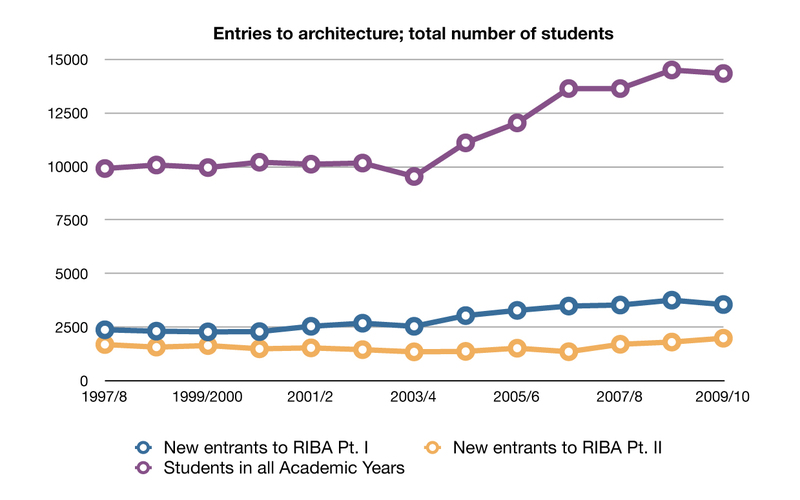 In doing so, the number of students entering RIBA validated courses maintained a steady year-on-year growth between 2001/2 and 2008/9 of 5.45%. Given that the RIBA validated track to become a registered architect takes at least seven years, the data gets more interesting when you consider the statistics not just at entry into a course, but at its natural conclusion. 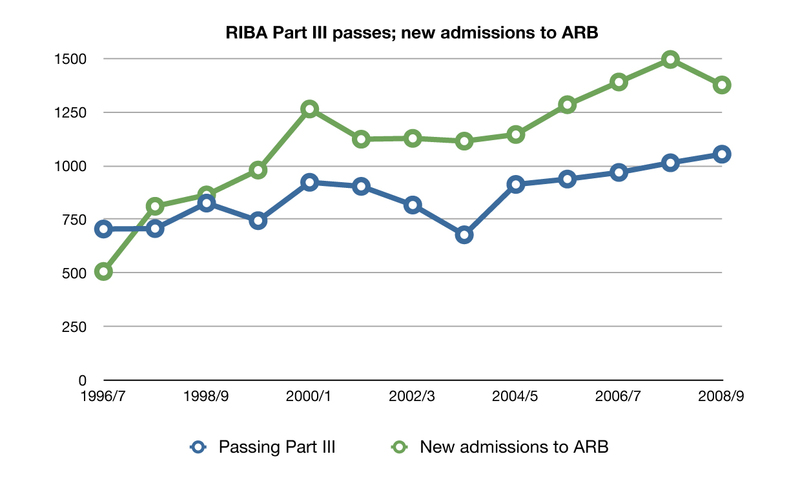 For instance, the following graph shows the number of students passing RIBA Part III courses and the number of new admissions (not including re-admissions) to the Architects Registration Board (ARB) – that data being extracted from the ARB’s annual reports. Again, with the exception of the RIBA data for 2003/4, which I’m treating with caution, there’s a broad correlation of the numbers: more people pass RIBA Part III, more people register with the ARB (a legal requirement to trade as an architect in the UK). The data behind the green line was supplied by ARB; the blue line by RIBA. Note, again, the blip in 2003/4 when there was lower participation than normal in the RIBA survey. 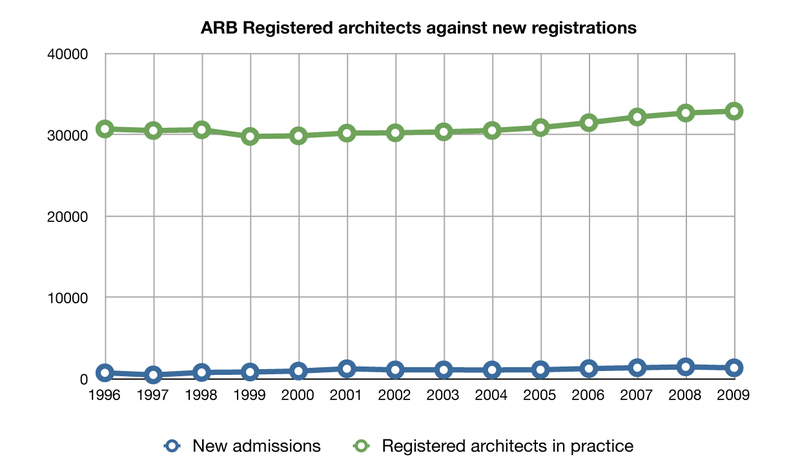 The modest increase in the number of newly qualified architects registering with the ARB over the last decade or so has contributed to a steadily increasing number of registered members: almost 33,000 across the UK in 2009. 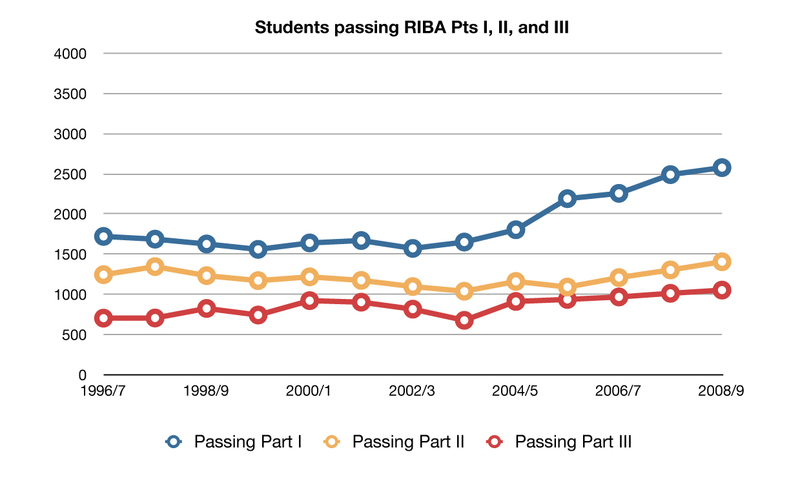 Looking back through the RIBA Education data, we can go into more detail about the number of students passing the three stages of an RIBA validated architectural education. As you can see from the above chart, however, the number of students passing Part II and Part III remains relatively stable, largely because the spike in entries to Part I courses in the early ‘noughties’ hasn’t yet progressed that far through the system. 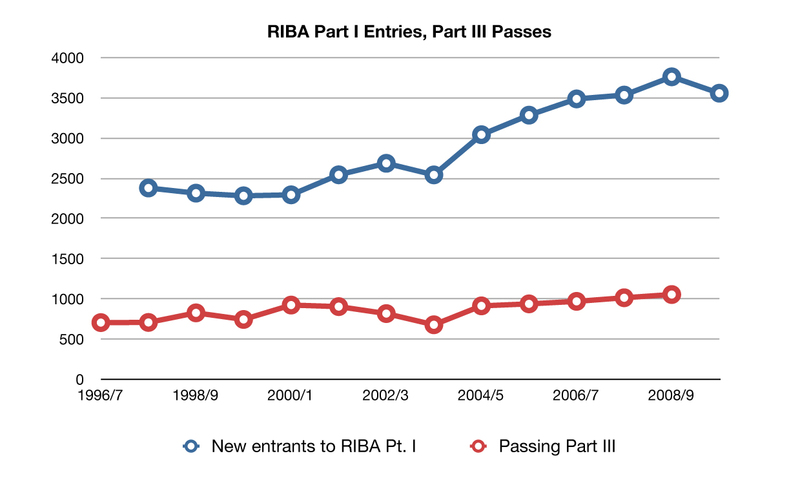 The RIBA Education Statistics report from 2010/11 (due around about October) will perhaps begin to tell us more about the longer term effects of that rise in Part I entrants and passes. Of greatest concern, however, for the shape and structure of architectural education today, are the numbers presented in the final chart below, mapping entries to RIBA Part I courses and passes from RIBA Part III. This is something that my supervisor, Prof. Ruth Morrow, has talked about at some length in recent lectures at QUB and elsewhere. 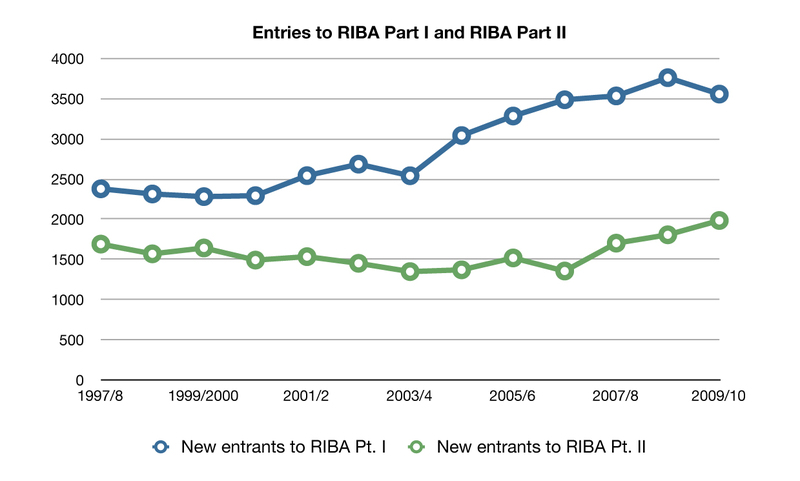 Regardless of the fact that the shortest amount of time a student can spend between starting Part I and finishing Part III is seven years (and that the spike in admissions from the early 2000s onwards has yet to be reflected in Part III passes), there is a dramatic drop-off between the number of people who enter RIBA Part I and complete RIBA Part III. In 2000/1, for instance, less than half the number of people passed RIBA Part III (and received the accreditation to become a legally registered architect) as passed RIBA Part I. Notwithstanding the effects of the last decade’s expansion of numbers in HE and AE, there has long been a massive drop off between the number of students who start studying architecture as do who finish and enter the profession. As Prof. Morrow herself asked at her QUB inaugural lecture last summer, where do these students go? Many of its fiercest advocates will argue that AE’s strength is its quality and richness as a broad education in the humanities that can prepare students for any number of career paths. But as we approach the 2012 introduction of student fees of up to £9,000 per annum, I’m increasingly interested not only in where these students go to, but how AE itself can be better design, structured, and validated to support the aspirations, needs and demands of students who are increasingly likely to never practice architecture in a traditional sense. On Tuesday, I’ll be traveling to London to take part in the RIBA’s ‘Tough Times’ Student Forum. I’ll be particularly interested to take the pulse of AE from the perspective of those students on taught courses from up and down the country. The experiences that they’ve had and the ideas that they put forward will, I hope, shape the continuing evolution of AE in this country. Meanwhile, if you have any comments, corrections or suggestions regarding my handling of the data, please drop me a line. Establishing a shared understanding of how the architectural community can best support architecture students in tough times. This unique forum is open to students from UK schools of architecture. It will be chaired by Niall McLaughlin and give you the chance to share your thoughts with RIBA staff, practitioners and students from other schools. The forum is open to thirty students, ideally representing a range of architecture schools and students at different stages of study. As capacity is limited, at this stage we cannot promise a place to every applicant. If you secure a place we will reimburse UK travel expenses (second class, advance booking on set tickets). The forum was promoted on RIBA Education’s Facebook stream earlier this month and was covered briefly in Friday’s Building Design. The subsequent “conversation” amongst online readers of the article (of varying shades of anonymity) reveals some of the usual perspectives on the relationship between the RIBA and architectural education today. For my part, I’ve emailed the RIBA with an expression of interest, and I fully expect not to be invited. I may be (as far as I know) the only person in the UK writing a PhD on architectural education at the moment, but I expect the RIBA to prioritise the very limited number of just thirty places to just students on taught courses. 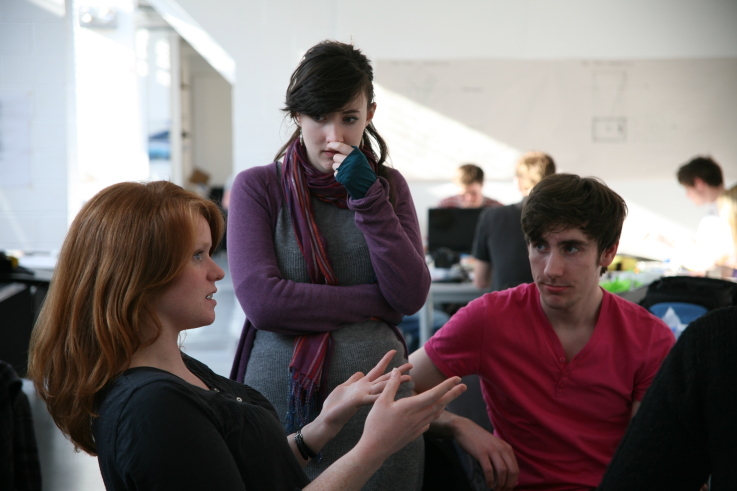 The attitude of the RIBA towards students of architecture – both through the validation procedures that accredit UK schools of architecture every four years, and events such as these – is that traditional architectural practice in a commercial environment is the principle aspiration for everyone. And yet anecdotal evidence and fag packet calculations of recent RIBA statistics would suggest that as many as two thirds of all students who commence RIBA Part I (undergraduate) studies in architecture never complete Part III (professional examination that follows the postgraduate degree or diploma and a minimum period post practice-based experience). While it is a recurring feature of architectural education to call for its reinvention, the difference between previous upheavals and those of today is that they’re now out of the control of the profession or academe. Architecture has always been expensive to study. Now, however, the stable little ecosystem of five years in university and two years in practice has been received a blinding broadside by the sudden reality of £9,000 p.a. tuition fees. While the interface between academe and profession adapted begrudgingly when the Labour government first introduced tuition fees, the disrespect between the two has suddenly been brought into sharp relief. While few architects save lives in their day to day line of business, because of the RIBA Validation criteria and the established system of architectural education in this country, both they and doctors have to spend lengthy periods at university. And now that a three year degree at pretty much every self respecting university costs £27,000 before living and ancillary costs, the maths doesn’t add up for architecture. As those selected comments on the BD article above show, students are reluctant to spend such a huge sum of money without better employment prospects or remuneration, and employers are reluctant to pay their graduates more without education becoming demonstrably more vocational. A stubborn rump of practicing architects expect graduates to be ready for professional practice, even though as little as one third of graduates ever take up a career in the profession. Neither the RIBA, nor the schools of architecture, nor the profession itself, can do anything to reverse the Conservative-led government’s decision to charge (and the Liberal Democrat’s failure to obstruct) university tuition fees of £9,000 per annum. It is, therefore, up to practitioners, educators and the RIBA to negotiate a future for architectural education and practice. The RIBA are to be congratulated for the apparently genuine intent to see a diversity of students represented at the forthcoming Tough Times forum. Reimbursing travel costs is also to be commended, especially for those students selected to represent schools far from London. However, given the RIBA’s diversity of spacious venues, it’s regrettable that only a small number of students can attend. While I appreciate the venues are commercially available to others and are likely booked up, it’s a shame that the strategic decision wasn’t taken to open the event to a wider number of delegates. If RIBA funds are too tight to reimburse all attendees, then some students, like myself or those studying in London, could have attended without necessarily claiming travel costs. Thirty travel bursaries could then have been provided for those in genuine financial need. I hope to see you at Tough Times. But then I doubt I’ll be invited. Postscript, 24 hours later: I’ve been invited to attend. Egg, face, etc. As a follow-on from EASA 2010 in Manchester last year (which I sadly couldn’t attend), the newly formed Archiecture Students Assembly (ASA) will be having its inaugural meeting in Manchester on 20 June. The Manchester School of Architecture (msa) is prepared to host an inaugural meeting of the ASA – Architecture Students Assembly. ASA is the provisional name for a network of student representatives from the schools of architecture within the United Kingdom. The ‘assembly’ is part of the easa010 legacy and has grown from a generally shared desire for the establishment of a viable network that promotes communication between students in UK schools. The inaugural meeting will promote the idea of ASA as essentially a communication network that could to support and promote architecture student events, have the capacity to harness student opinion and to engage with other established, relevant, education organisations, both nationally and internationally. At the initial conference delegates will assume the role of representatives and will have opportunity to formulate this student centred and led organisation. It is anticipated that there will be presentations by easaUK, a European focused network who will talk about the annual student summer school event, and by established education bodies who would value a dialogue with architecture students across the UK. The aim would be that delegates establish a mission for the organisation and a basic operational structure that could be the subject of evolution. Support from the msa will aim to ensure the durability of the network by maintaining an up to date database of student representative contact details for each school. The msa will provide a paid network coordinator for this group as part of its support for the mssa (Manchester Student Society of Architecture) that includes an office base with internet / email / phone connectivity. The initial development and organisation has been undertaken by people involved with easa010 and they will continue to coordinate the inaugural meeting and provide advice on the establishment and development of the network. The baseline aim is to establish an active communication network with one key annual event (conference style) that could be used to engage with SCHOSA (and potentially the RIBA and ARB) – This would conditionally maintain the support of the msa and potentially SCHOSA who have assisted student networks in the past. In order to begin Heads of UK Architecture Schools will be requested to provide the email contact details of two named student representatives from their school who could be invited to attend and / or receive details of the inaugural meeting. Perhaps, finally, a worthy spiritual successor to the long extinct BASSA and the practically extinct ARCHAOS? The proof will be in the pudding, although I support any initiative to establish a truly national representative body of architecture students. I’m too busy coding (focused, then axially, if you’re interested) some of my own interviews today, but I hope to read and comment on the report more closely soon. Until then, the usual completely predictable provincialist observation from me. The report based its findings on a survey that included a fourteen question interview with eleven architects, eleven engineers and fifteen students or recent graduates. The fifteen students interviewed were from from 8 schools, 7 of which were in London. There are, if my maths and short term memory serves me correctly, currently forty-three RIBA validated or part-validated schools of architecture in the UK. In addition to the forthcoming Live Projects 2011 colloquium (of which you’re probably bored of reading by now), Belfast readers from within and outwith the architectural community may be interested to hear about the ongoing call for participation in the 2011 Street Society 2011 (pdf, text below). This will be the second year we’ve run this one week vertical live project between our first and fifth year students of architecture. We’re on the lookout for potential clients (community groups, organisations, charities etc) who would be interested in working with our students for one week in March. the Street Society is a one- week design research office. It brings together first year students from both the undergraduate BSc Architecture and the Masters in Architecture course in the School of Planning, Architecture and Civil Engineering at QUB, to work on a range of projects for clients. It will run between Monday 7th and Friday 11th March 2011. The Street Society is now looking for potential clients – external organisations, architects, built environment professionals, community organizations, charitable bodies etc. Potential clients will have a question that architectural students can help to answer; a design problem; a site to evaluate; a building, material, or construction process to investigate, document, or better understand. The Street society will be made up of 10-12 groups with a mix of undergraduate and postgraduate students in each. The postgraduate students will act as project managers and as contacts for each client. …no later than 12.00 midday, Wednesday 2 February 2011. Project submissions will be reviewed and accepted on the basis of an overall coherence within the Street Society programme / aims and in terms of achievability of outcome within the five day time frame. Applicants will be notified of their inclusion no later than Friday 11 February, and should be available to attend preparatory meetings and consultations on Friday 4 March. Save the dates, and we hope to welcome you to Belfast in October. Peripheries are increasingly considered in contemporary culture, research and practice. This shift in focus challenges the idea that the centre primarily influences the periphery, giving way to an understanding of reciprocal influences. These principles have permeated into a wide range of areas of study and practice, transforming the way we approach research and spatio-temporal relations. How do notions of periphery and proximity impact on the construction of cultural memory? Is globalization facilitating the inclusiveness of peripheries or denying their local value to favour the centre? Does being on the edge heighten or transform architectural practice? What infrastructure is required for peripheral positions to exist? How are peripheries networked to one another and to centres? Can architecture support peripheral populations, and can these voices offer critique of architectural practice? How does interdisciplinarity — the communication between perceived peripheral disciplines — affect architectural practice? What are the shifting boundaries of alternative or peripheral currents of education, research and practice? Do architecture schools recognize the importance of peripheral subjects in their teaching? Queen’s University’s School of Planning Architecture and Civil Engineering operates within a context of an increasingly non-metropolitan society, on an island of rural communities resistant to normative patterns of urbanisation. The culture, economies, politics and social networks in Ireland are often perceived as “on the edge of Europe”; it is a place of experimentation, translation and evolution. Belfast is thus an ideal setting in which to pose questions of periphery: it is a city in simultaneous states of flux with multiple political and social reiterations and repositionings. In a city where extremism was once the norm, there is much to ask about how to moderate and manage the tensions and potentials that exist between the edge and the centre. Contact peripheries@qub.ac.uk with any questions. If there’s one thing that my study of architectural education has established, it’s that it’s all about the money. As a fully funded postgraduate research student, I’m in the privileged position of not having to deal with juggling the cost of my course and the cost of living, although before you hurl abuse I do have a five figure student loan to repay. For me, studying from 2001 to 2008 meant watching my tuition fees rise from about £1,000 to £1,500 a year. According to a number ill-informed protestors, scandalised tabloid journalists and newly-reformed Trotskyite Labour politicians, the funding package announced by the coalition government this week means every student on every course at every university will soon be paying £9,000 a year to study, implying that an architecture graduate will face a tuition bill of £45,000 (plus interest). The £9,000 figure has morphed into a rallying cry, as if that’s what every 18 year old is going to have to stump up to go to university next September. There has been a complete failure of communication on the part of the Conservatives, Liberal Democrats and (by association, because they generally repeat what those fine folks are saying) the British media. The university funding package allows universities to set tuition fees as high as £9,000, not universally at £9,000. Explaining this to student protestors seems to be a waste of time, especially as recent violence on the streets of London is now morphing into an amorphous riot of pent up aggression against everyone who might be to blame for our country’s ramshackle economy: the Tories, the Lib Dems, and (in a bizarre acquisition of the UK Uncut campaign) Philip Green. Well performing, well resourced and high ranking members of the Russell Group may indeed be able to charge £27,000 for some three year courses, but many others will not. Furthermore, unlike the current system, fees will be collected once the graduate starts earning £21,000 per annum – that threshold is £6,000 higher than the current insanely low income threshold of £15,000, at which point I myself started to re-pay my own student loans. Bewildered Liberal Democrats, such as Paddy Ashdown in this clip, have been amazed by the breadth of public misunderstanding on this simple fact. Fees will rise, but they will not be collected until the graduate is earning a much higher income, and repayments will be proportional to that income. The Labour Party blindly insists it would introduce a graduate tax to pay for university education, but as we’ve learned from the increasingly untenable financial state of the Scottish university system, that simply isn’t viable. As soon as a recession bites, the brain drain of graduates going to work abroad means you lose that tax income. In the past three months, I’ve been traveling the length and breadth of Britain and Ireland to speak to academics and teachers at seventeen schools and universities about architectural education and live projects. Though the focus of my interests are the live projects themselves, the bigger picture of higher education is of importance to my study. Having met with academics in England, Wales, Scotland, Northern Ireland and the Republic of Ireland, one thing appears to be universal: architectural education is in a dire financial situation. While every academic in every discipline is likely to complain about cuts in funding, teaching and resourcing, unlike any other discipline taught in the university, architecture is caught in a perfect storm. It feeds a professional body that insists on five years of study, it predominantly maintains a culture of one-to-one tuition in large studio spaces that are only used for one third of the year, and it underperforms in research funding and output relative to almost every other discipline in the academy. Graduates are also entering a profession with little sympathy for their financial situation. The average salary across the whole profession in 2009 was £45,000 (pdf). The average salary of an architect under the age of 30 (and therefore likely to include most recent graduates) was £30,000. Personally, I’d be delighted to be earning £30,000 right now, but that figure is horrifying when you consider the length of time it takes to study and the cost already being borne to graduate in architecture. Architecture is one of the longest courses in the university, but the starting and average lifetime salaries of architects do not reflect the cost. Next time you bump into a student of medicine (they’re some of the others who spend just as long at university to get professional accreditation), ask them what they expect to be earning at the age of 30. The expectation that students should complete a three year degree and two year diploma or masters in order to become architects has been placed at the heart of British architectural profession for a number of decades. But it was put there by a population of architects who didn’t have to pay for their education. Since most of them were men, precious few took career breaks to start families before rejoining the profession. The profession is simply incapable of paying its graduates salaries that are proportional to the contemporary cost of education. It can’t even agree whether or not to condemn the despicable practice of employing unpaid graduates. The route to architectural qualification through supervised practice or apprenticeship has long been extinct, and I do not argue for its renaissance. Recent experiments in practice-based diplomas and masters degrees in architecture at British universities have struggled, simply because when the work dries up, the possibility to complete your degree also dries up. But time and time again, I’m hearing the opinion being voiced that there should be some kind of alternative. I don’t know what that alternative is, but I do believe that architecture is in a unique position. Because of our ‘perfect storm’, we also have the opportunity to be the site of meaningful experiments in the nature of higher education. 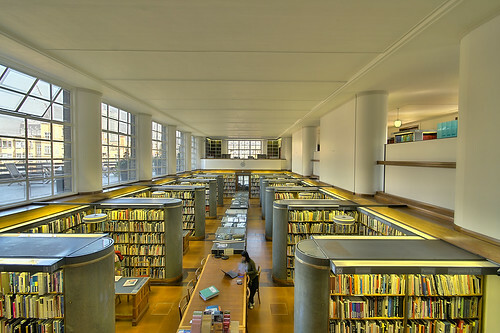 The 2010 RIBA Research Symposium has been announced, and it will take place on 23 September at Portland Place in London. Last year’s lively and diverse programme was entitled Changing Practices. This year, practices have duly been changed, and the theme is back on safe high architecture territory with the theme Does Beauty Matter? 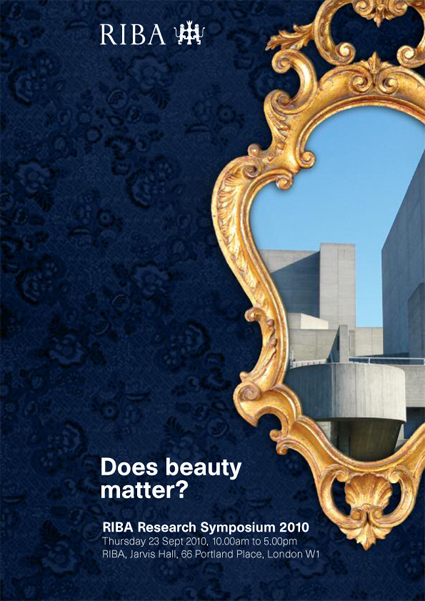 RIBA Research Symposium 2010: Does Beauty Matter? The fifth annual RIBA Research Symposium will address one of the basic principles of architecture: beauty. It is both a universal good and an enduring source of controversy, but what does it really mean? Architecture is often judged on its success in creating beauty, yet beauty can also be a slipper, uncomfortable and divisive subject. As a society we are uneasy about discussing beauty, both on an individual and a professional level. The word rarely features in modern political discourse, and the concept can be dismissed as arbitrary, subjective, unnecessary, unaffordable, or elitist. Debates purporting to be about the beauty of the built environment often turn out, on closer inspection, to be about style, taste or political symbolism. So how can beauty be both understood and applied? Do beauty and wealth go hand in hand, and if so why? Do we need our places to be more beautiful, and what would happen if they were? Can we value beauty, measure it or define its role in policy? Can anyone hoping to be taken seriously argue in favour of beauty? And what is the responsibility of the architect? The symposium will tackle the significance and function of beauty today. Delegates will debate with architects, developers, community activists and politicians, informed by new research. High profile contributors will bring their varied perspectives to bear on the future of beauty, and the implications of beauty in our society. Further info and booking here. I hope to attend, but there’s something from Pony Pie in the oven in Glasgow that week that I cannot miss either. Academic sugar daddies with air miles please apply within. Above: fifth and first year students discussing their project in an ‘interface zone’ along Northumberland Street, in west Belfast.